Every prospect will have either a Hot, Cold, or Blow Out status which defines them. The status of each prospect can be found easily on their prospect profile, or alternatively the prospect database can be searched by their status. A 'Hot' prospect status indicates that this prospect has recently showed interest in joining your gym. This could be through a range of methods such as starting the signing up process online but dropping out before completion, by completing an online prospect form, or even by walking into the gym to query memberships. Hot prospects are the most likely to be converted into paying members, and can therefore be targeted in this way. A 'cold' prospect is one which has showed interest in the club, but not recently. 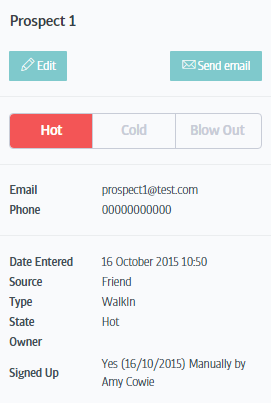 The system will automatically change a prospect from 'hot' to 'cold' following the guidelines set out in the additional settings. A cold prospect is therefore one which could still be converted into a paying member, however is not as current as the 'hot' prospects. A 'Blow Out' is a prospect who is no longer a viable lead. This could be for a variety of reasons, such as the prospect asking not to be contacted again, has moved abroad, or has joined another gym. A prospect can only be changed to a blow out status manually by a staff member through the profile page.